The Postgraduate Conference enabled discussions that interrogated the concept of intersectionality and constructions of gender as these intersect with other components o f identity derived from political, social, cultural, religious, ethnic, and racialized discourses. Intersectionality (Crenshaw, 1991) is a framework and a methodological lens for understanding the kaleidoscopic subjectivity of women. Within Gender and Women studies, a woman’s subject status is claimed, held, and negotiated at the intersection of competing sources of disadvantage and discrimination. Class, race, caste, age, religion, and ability act within overlapping realms to shape women’s lives in the modern world. We are seeking to explore the tensions that emerge between theory and lived experience; between professional practice and theoretical models of gender and community interaction; and between public pronouncements of gender equality and representations of identity in historiography, literature, film, and popular culture. 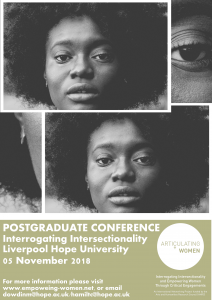 This conference was part of an AHRC funded International Network Project that seeks to scope the potential and limitations of intersectionality in relation to both theory and praxis. In keeping with this broad-based agenda, the organisers seek contributions from any discipline and welcome interdisciplinary approaches. We accepted papers exploring gender politics in relation to both Eurocentric norms and to different communities, societies, and nations, including papers and panels examining the issue of gender in relation to multiculturalism.